Ancient Animals on YKYOSSFW this week. To kick things off I’ve found a great image of a lizzard, as stated by Ben Wittick on this photo titled “”Lizzards of New Mexico caught on Santa Fe Mountains May 1880” . The lizard is amazing but many people don’t know a great deal about them. These interesting facts though will give you some insight about how these fascinating creatures live. They can be very different from one species to the next too. With that in mind it is important not to generalize when you are talking about the Lizard. It is possible for the Lizard to lose their tail when they feel that they are in danger. It can be a means of escaping from a predator. In time the tail will grow back again. The tail they leave behind will move and confuse the predator. What grows back will be slimmer and often a different color. There are some species of Lizards with very small legs or have no legs. They are often mistaken though for a type of snake. One way to tell is to look for eyelids and to see if you can find external ears. If those physical characteristics are found you will be able to identify it as a Lizard. Lizards are able to smell by tasting the air around them. This is why they are often seen with their tongues going in and out at a rapid pace. For the most part Lizards aren’t dangerous. There are two species though that have a dangerous venom. They are the Gila Monster and the Mexican Beaded Lizard. The largest species is the Komodo Dragon. It can grow to a size of up to 10 feet. The smallest species are just a couple of centimeters long. It is possible for the teeth of a Lizard to be replaced throughout their life. There are a few species though that don’t do this. There are some species of Lizards that have the ability to squirt blood out of their eyes. They have horns and they are able to squirt blood for a distance of up to 4 feet. This is a way for them to be able to defend themselves against predators or when they feel there is any type of threat to them. Lizards are able to conserve water by excreting salt. When water is in short supply they will do this often and have a white reside on the body. The Gecko is the only species of Lizard with vocal cords so they are the only ones that can make sound. The other species all use body language as a way to communicate with each other. There are more than 5,600 different species of Lizards around the world. There is evidence that Lizards have been on Earth for more than 200 million years. It is believed that some of them used to be as large as the dinosaurs. The Chameleon is able to change the color of the body. This allows it to have a method of hiding from predators as it will blend into the surroundings. Lizards live everywhere in the world except in Antarctica. Lizards grow for their entire lives. They will shed their skin when they need to grow more. All species of Lizards are cold blooded creatures. Lizards enjoy spending time basking in the sunlight. There are species of Lizards that can change colors due to their mood and not just due to the environment. The largest class of Lizards is the Skinks with over 1,300 different species. Most species of Lizards are amazing climbers. The Gecko is the fastest climber of all of them. Some of the species are able to run upside down as well as backwards at very fast speeds. The Lizard is very closely related to another reptile – the snake! Some lizards can detach their tails if caught by predators. The upper and lower eyelids of chameleons are joined, leaving just a small hole for them to see through. They can move their eyes independently however, allowing them to look in two different directions at the same time. 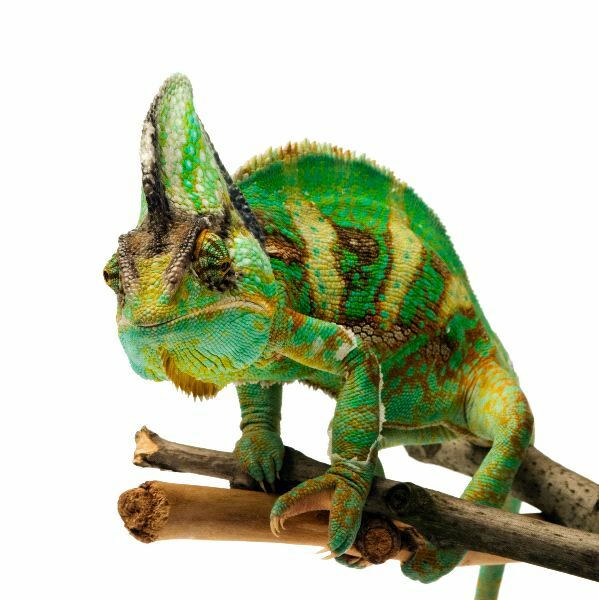 Chameleons have long tongues which they rapidly extend from their mouth, too fast for human eyes to see properly. Some chameleons have the ability to change color. This helps them communicate with each other and can also be used for camouflage. Geckos have unique toes which allow them to be good climbers. Iguanas have a row of spines which run down their back and tail. 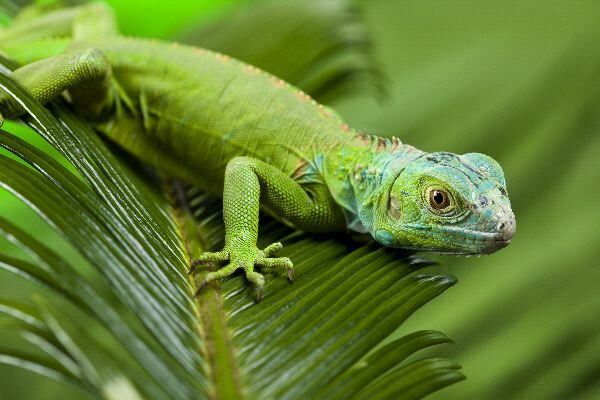 Green iguanas are popular pets. The Komodo dragon is the largest type of lizard, growing up to 3 metres (10 feet) in length. They are found on a number of different Indonesian Islands. Komodo dragons are carnivores (meat eaters) and can be very aggressive. Date Original 1880 – 1890?